Melbourne (AFP) – Angelique Kerber and Madison Keys set up an enticing Australian Open quarter-final Monday, with one roaring through and the other having to dig deep to stay in the title hunt. Dangerous Czech Tomas Berdych, a two-time Melbourne Park semi-finalist, also powered into the last eight, demolishing Italy’s Fabio Fognini 6-1, 6-4, 6-4. His reward is a clash with either Swiss maestro Roger Federer or unheralded Hungarian Marton Fucsovics for a place in the semi-finals on Wednesday. 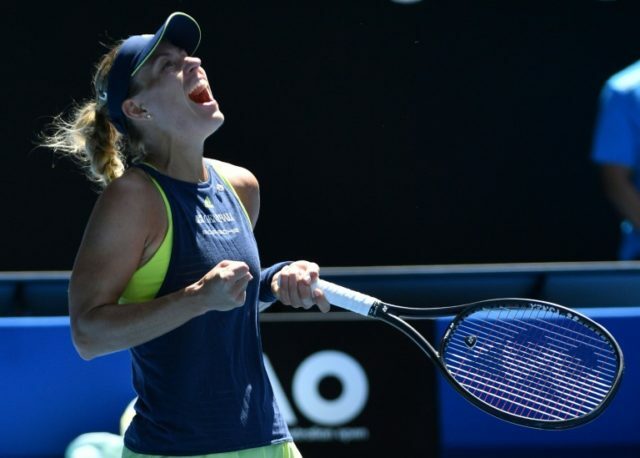 Germany’s Kerber is the only Grand Slam champion left on the women’s side of the draw, and she was given a big fright as she chases her second Melbourne Park crown after beating Serena Williams in 2016. Whoever wins that match will have a potential semi-final against world number one Simona Halep, although the Romanian first has to get past Japan’s Naomi Osaka on Margaret Court Arena. How she backs up will be keenly watched after her third round epic, where she was pushed to 15-13 in the third set by American Lauren Davis. The final women’s match sees sixth seed Karolina Pliskova take on fellow Czech Barbora Strycova, seeded 20. Berdych, a semi-finalist in 2014 and 2015 at his most successful major, easily beat Fognini with the 32-year-old saying: “I’m really enjoying every single moment on court. He is now in his seventh Australian Open quarter-final with Federer, who knocked him out in the third round last year, looming. The defending champion takes aim at an incredible 14th Australian Open quarter-final later when he faces one-time training partner Marton Fucsovics. The Swiss maestro, 36, has made at least the last eight every year since 2004, bar a hiccup in 2015, with the odds of him doing so again heavily stacked in his favour. Fucsovics has never beaten anyone ranked higher than 13th and is making his tournament debut. Novak Djokovic is also in action in a night match as he looks to reach the last eight in Melbourne for a 10th time, with a tough test against talented Chung Hyeon. The glasses-wearing South Korean, ranked 58, upset fourth seed Alexander Zverev in five sets in the round of 16 and Djokovic is wary. “He’s playing great. He’s fit. He doesn’t have too many holes in his game,” he said. The winner will face either Austrian fifth seed Dominic Thiem or American surprise packet Tennys Sandgren.